With technology booming around the globe, it’s imperative to get kids involved with the technological revolution. Here at Home Away From Home of Florida, we incorporate technology throughout our daycare centers. We strive to provide kids with the opportunity to learn through technology and the opportunity to utilize technology that they will encounter throughout their lifetimes. 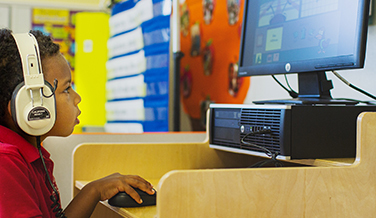 We get our kids in touch with technology at an early age – incorporating our computers into preschool learning. 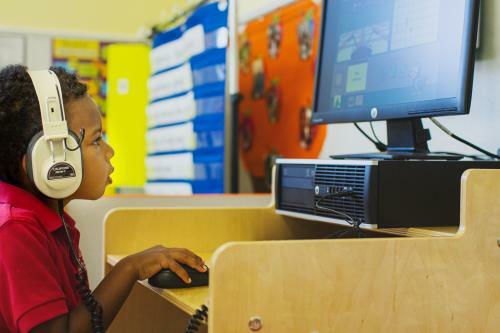 Did you know that entry kindergarten tests are taken on computers? We provide desktop computers, keyboards, mice, monitors, and headphones so that your young one can learn to properly use computer technology at a young age. Learning computer basics starts with hands on utilization of our computers. What do our tykes learn on the computers at our daycare centers? Kiddoes learn to use the keyboard. They learn specific letters, and where those letters are located. They also learn basic commands that the keyboard can perform, for example, using the enter key and the shift key. In addition, our kids learn how to utilize a mouse to control the cursor. While learning basic skills, kids are encouraged to learn through various fun educational applications we’ve downloaded onto our computers. With computer technology, Home Away From Home kids are ahead of the curve. If you’re further curious about our computers, check out our academics/program page. Or, as always, you can get in touch with us! We’re here to answer your questions and provide your child(ren) with the best daycare in Florida!